For the second time in less than three months, Justin Bieber got pulled over while driving his completely ridiculous, customized "Batmobile." This time around, the pop star was stopped by police after he made an illegal left turn from the middle lane. First things first, take a deep breath: He wasn't thrown behind bars. Nor did the guy hurt himself in any way, despite his maddeningly reckless maneuver. Yes, we realize he wasn't caught doing donuts, or Tokyo drifting. But just imagine the petrified look on your grandmother's face if a 17-year-old driving a fake Batmobile were to cut her off. If that's not heart attack inducing, we don't know what is. Needless to say, Bieber got off with a warning, fueling the age-old conspiracy theory that celebrities can pretty much do whatever they want without getting in trouble. But look, we have no problem with the officer's decision. What we do take offense to: the cop's inability to penalize Bieber for driving such a tacky looking vehicle. The singer's worth millions, and yet he winds up buying a Cadillac that looks like it's been spray painted and covered in decals a 10-year-old would buy from Toy Boat. Cadillac Don came close to fooling us into thinking Caddys were cool again. But here's the thing: The second oldest automobile brand in America hasn't been culturally relevant in decades. Hell, most young adults probably feel more connected to Cadillac margaritas than they do the luxury car brand. 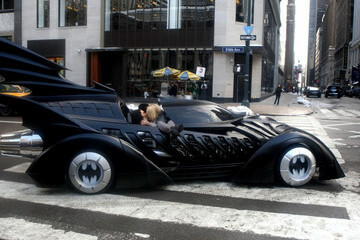 Now, if Bieber had bought himself the actual Batmobile, we gladly would have sung his praises. Alas, after spending all of his extra cash on leopard skin shoes and a pet snake named Johnson, he could only afford a knockoff. Worse yet: After making our intern watch 200 hours of Judge Judy, we've concluded that, tragically, it's perfectly legal to own a Cadillac modeled to look like the car a comic book character drives. And so, Bieber's record remains as spotless and clean as his baby face.